Source: CICH graphic created using data adapted from Canadian Mortgage and Housing Corporation. (CMHC) Canadian Housing Observer. 2014. https://www.cmhc-schl.gc.ca/odpub/pdf/68189.pdf accessed March 20, 2017. In 2011, 12.5% of Canadian households were in core housing need. That proportion varied among the provinces and territories. 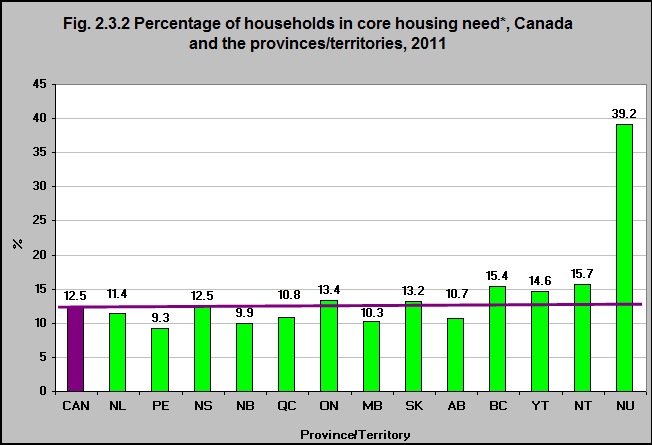 9.3% of households in Prince Edward Island were in core housing need. That was the case for 15.4% in British Columbia, 15.7% in the Northwest Territories and 39.2% in Nunavut.